Force India's Sergio Perez hits both Kimi Raikkonen and Sauber's Adrian Sutil on the first lap of the United States Grand Prix in Austin. 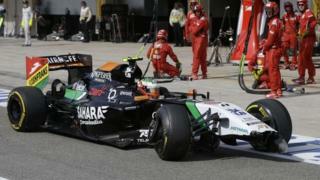 The accident meant both Perez and Sutil had to retire from the race at the Circuit of the Americas. Perez has been handed a seven-place grid penalty for the next race in Brazil after the stewards deemed he was responsible for causing the collision.